Don´t miss an unique opportunity to study abroad, get to know another culture and meet new friends. Improve your labour market position! VŠE enables to all its students to participate in the semester exchange programs at more than 250 partner universities worldwide. Applications for the academic year 2019/2020 have to be submitted in February 2019. The selection procedure for semester exchange is always carried out for the whole upcoming academic year. 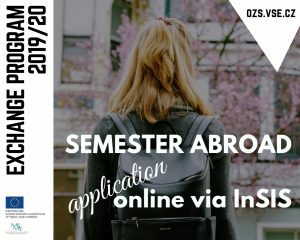 Applications for exchange semester abroad in Bachelor’s degree program (3rd year) can be submitted from 19th to 26th February 2019. Students can go on exchange once during their Bachelor and once during their Master studies. VŠE offers its students almost 900 spots in 50 countries, 310 of the spots for Bachelor students. Last year, most students have traveled to European countries within the Erasmus+ program grant. However, thanks to the VŠE support many students have had the opportunity to study in more distant parts of the world, such as the United States, Mexico, Brazil, Hong Kong or New Zealand. VŠE students do not pay tuition fees at partner universities, which might be relatively high in many countries, e.g. in Canada, in the USA, Mexico or Australia. Moreover, all the students receive a scholarship for study abroad stay from VŠE or Erasmus+ program in order to cover the increased expenses related to the realization of the mobility. Students from disadvantaged socio-economic backgrounds or students with special needs might receive an extra funding as well. Details of the selection procedure criteria, a list of partner universities and other useful information can be found on the International Office website.